that All-4-One sings the best songs in the world. 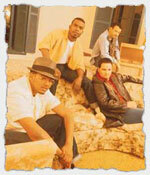 All-4-One consists of four talented members: Jamie Jones, Alfred Nevarez, Delious, and Tony Borowiak. All-4-One released their first single, So Much In Love in 1994. A song expressed the feelings of undying love, the song was a huge hit. Releasing another song in the same year, I Swear, which became 1994's biggest selling single. All-4-One reached new heights when they released their debut album, the self-titled All-4-One, which won a Grammy and an American Music Award. And The Music Speaks was All-4-One�s second album, which included the Grammy nominated single for Song of the Year, I Can Love You Like That. Since then, they've released contributions to the Space Jam and Disney's The Hunchback Of Notre Dame soundtrack with I Turn To You and Someday. They've also released the album, On and On, featuring hits like I Will Be Right Here and I Cross My Heart. But the biggest news of all is the release of their newest album A41 featuring the hit single, Not Ready For Goodbye. All-4-one just keeps it goin' on! Check out Joey Lee's Planet Sammi for news about Hong Kong superstar Sammi Cheng. He writes: "Sammi is collaborating with American group All-4-One! I wrote to the webmaster of All-4-One's official webpage, Tim O'Brien (who is also the producer of the duet "I Cross My Heart", sung by All-4-One and Sammi) and he wrote me back, filling me in on the details. Isn't this exciting?" Check out his page for more info! All-4-One's On and On album has finally hit the stores in Africa and Asia!! Check out new songs from All-4-One album like I'll Be Right Here, Smile like Mona Lisa, Whatever You Want and many other great songs! If you're looking for more lyrics and midi files, make sure you check out the Albums section! 1997-2002 All-4-One. Created by Lynn Hung and Stanley Sy.